(17/P64) TRENTON – The Department of Environmental Protection has published a monarch butterfly conservation guide to educate the public about the insect’s significant population decline and what steps can be taken to expand its presence in New Jersey, Commissioner Bob Martin announced today. Monarch butterflies have had a long and storied presence in New Jersey, for their extraordinary annual migratory flights every fall along the East Coast, through Cape May, on the way to Mexico for the winter. These butterflies also are a very recognizable indicator species for the health of a wide range of insects that have an essential pollinating function. A number of factors, such as significant habitat loss in the United States and Mexico, including loss of plants on which to feed, have contributed to a 90 percent decline in the eastern U.S. population of migrating monarch butterflies during the past 20 years. In the central United States agricultural belt, which is the monarch butterfly’s main flyway from Mexico, use of certain herbicide-tolerant crops can contribute to the population decline. In New Jersey, the USDA Natural Resources Conservation Service is working with farmers and landowners to promote and create a healthy habitat for the monarch butterfly. The guide provides an overview of the monarch butterfly’s lifestyle and migration pattern, habitat needs, environmental and cultural significance, factors contributing to population decline, efforts made in research, conservation and public education, and recommendations on how to help the distinctive butterfly. The plight of the monarch butterfly’s rapidly declining population and habitat was documented in a 2014 petition to the U.S. Department of the Interior to have the monarch butterfly listed as a threatened species under the Endangered Species Act. 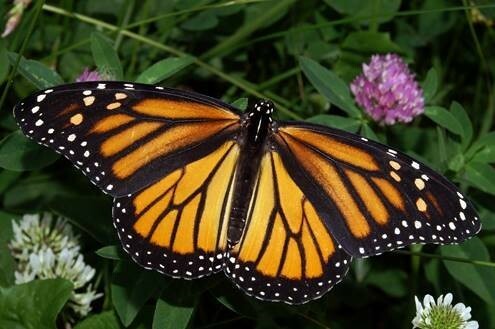 The petition notes that migratory butterflies in eastern and western North America represent the vast majority of monarch butterflies worldwide, and that the monarch is threatened in a significant portion of its range. Eastern monarch butterflies are typically seen in New Jersey during the summer. In the past, visitors flocked to Cape May to see awe-inspiring numbers of monarch butterflies during the fall migration season, as the insects gathered to journey to wintering roosts in Mexico, but those experiences dwindled as the butterfly’s population plummeted. Cape May’s important role in monarch butterfly migration led to the establishment in 1990 of the Monarch Monitoring Project, which gathers data and conducts informational programs on monarch biology and tagging. Reinvigorating New Jersey’s monarch butterfly population can start with the planting of milkweed and other nectar-producing plants. 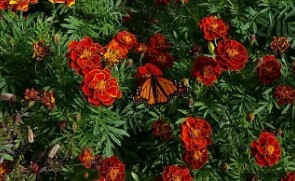 An average monarch butterfly in summer breeding areas completes its lifecycle in six to eight weeks. A female monarch butterfly ready to lay eggs must seek out milkweed, which is the only plant on which monarch caterpillars can feed. Once a female lays her egg on a milkweed leaf, the egg will develop for three to five days before hatching into a caterpillar. The caterpillar will grow for 10 to 14 days before entering the next phase of life, called the pupa stage. During this stage, a hard shell called a chrysalis will form around the pupa, to protect the caterpillar. The insect will remain in the pupa stage for 10 to 14 days before developing into a monarch butterfly, which can then feed off a wide variety of nectar-producing plants. DEP has undertaken a number of steps to improve pollinating habitats for monarch butterflies. In addition to Parks and Forestry’s efforts, the Division of Fish and Wildlife has provided milkweed seed to the New Jersey Forest Nursery for propagation. When those are large enough, the nursery will distribute seedlings to state parks and Wildlife Management Areas. Create pollinator gardens planted with native varieties of milkweed, such as common milkweed and butterfly milkweed, along with locally sourced, native wildflowers and other nectar-producing plants. Leave portions of yards, lawns or roadsides unmowed, or avoid mowing during bloom season. These practices allow wildflowers to grow and provide a vital food source from which pollinators can feed off plant nectar. Keep butterfly gardens pesticide free, or at least avoid pesticides that contain glyphosate, the active ingredient in certain herbicides, or pesticides known as neonicotinoids. Create buffer zones between areas treated with pesticides and natural areas, where milkweed and other nectar-producing plants may grow. Consider participating in the National Wildlife Federation’s “Butterfly Heroes Program,” which provides participants with a starter kit of seeds, and offers tips on how to start a monarch butterfly garden. Help youth understand the importance of monarch butterflies through teaching opportunities at school. Elementary-age children can learn to rear captive monarch butterflies to observe their life cycle, while middle school students can learn how to plant monarch gardens at home or on school property. High school students can participate in citizen science through initiatives to monitor monarch butterfly population during the fall migration season. Multiple resources on how to help monarch butterflies and other pollinating insects are available online.